Maybe 24 hours simply wasn’t long enough for Joe Fejes. 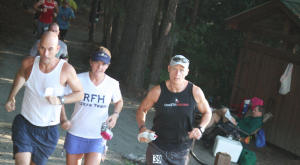 When the 49-year-old from Atlanta, Ga. toed the start line of the ninth annual Hinson Lake 24-Hour Ultra Classic, he wasn’t able to repeat his 2013 winning performance of 141.36 miles around the 1.5032-mile trail loop. Joe Fejes won the alatonfüred, Hungary Six-Day Race with a total of 606.243 miles. In fact, he stopped at 66.141 miles, a far cry from his 2013 performance. Fejes, though, might have already had his sights set on something bigger. Much bigger. And maybe that much bigger thing happened this past week as Fejes crossed the finish line of the Balatonfüred, Hungary Six-Day Race with a total of 606.243 miles on his two feet. Fejes’ total surpasses the modern-day American record and puts him third all-time among Americans. Ever. Only James Albert Cathcart in 1888 (1,000.613K) and Patrick Fitzgerald in 1884 (981.703) are above Fejes’ mark of 975.654 kilometers. Record keeping in the late 1800s wasn’t quite the science it is today. Regardless, Fejes ran his way into ultra running history over a 144-hour period. Fejes’ performance puts him in the top 10 all-time list for six-day runners and the 15th longest distance ever. Joe Fejes (25) circles Hinson Lake, but called it quits early in the 2014 race. The 2013 Hinson Lake winner just ran into the ultra running history books. Thirteen people have achieved 600 or more miles in a six-day race, and by only 12 individuals before Fejes. Heading into the May race, Fejes held the two highest mileage marks in North America in a six-day race — 555.36 miles in January 2014 and 580.30 miles in July 2014. Fejes is one of four Hinson Lake runners to earn the a spot on the U.S. National 24-Hour Running Team; 2014 Hinson winner Rich Riopel led Team USA last month with an eighth-place finish among the 179-runner field in the 2015 International Association of Ultrarunners World 24-Hour Championship in Turino, Italy. 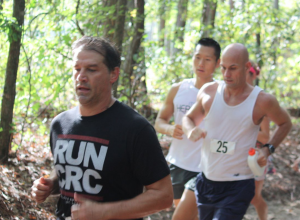 Hinson Lake course record holder Mike Morton qualified in 2012. Along with Fejes, 2012 Hinson Lake winner Jonathan Savage, from Charlotte, qualified for the 2012 team. The 10th annual Hinson Lake 24-Hour Ultra Classic, coordinated by the Mangum Track Club, is scheduled to begin at 8 a.m. on Saturday, Sept. 26. Entry opened Jan. 1 and was closed by race director Jerry Lindstrand fewer than five days later. The field reached 336 entrants in the initial list of confirmed entries. While Riopel won the 2014 race with 142.725 miles, 318 other athletes logged between one and 82 laps.